With little fanfare and even less notice, Vinny Dotolo and Jon Shook's eponymous Jon & Vinny's dropped on Monday in what is certainly one of the most hotly anticipated debuts of the year. 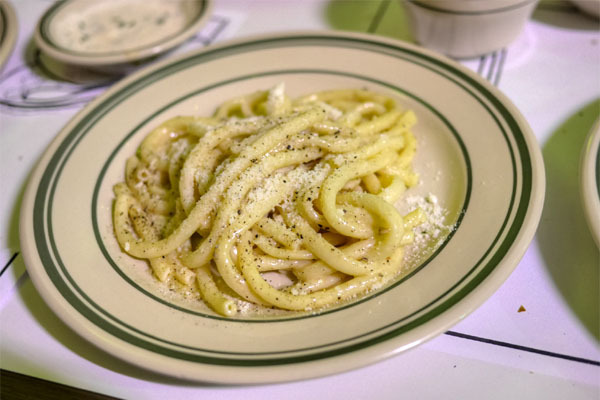 The restaurant is the pair's ostensibly kid-friendly ode to Italian-American cooking, and though I initially had no plans to visit on opening night, I was eventually cajoled in attending (though admittedly, my friends didn't have to twist my arm too hard). 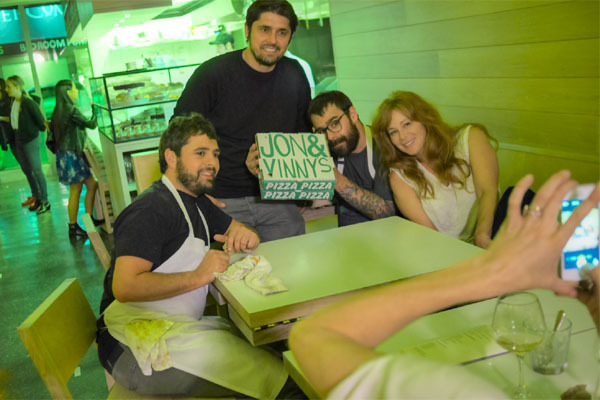 Jon & Vinny's is situated in the former home of Damiano's Mr. Pizza, which closed in the middle of 2013 shortly after the launch of Trois Mec. 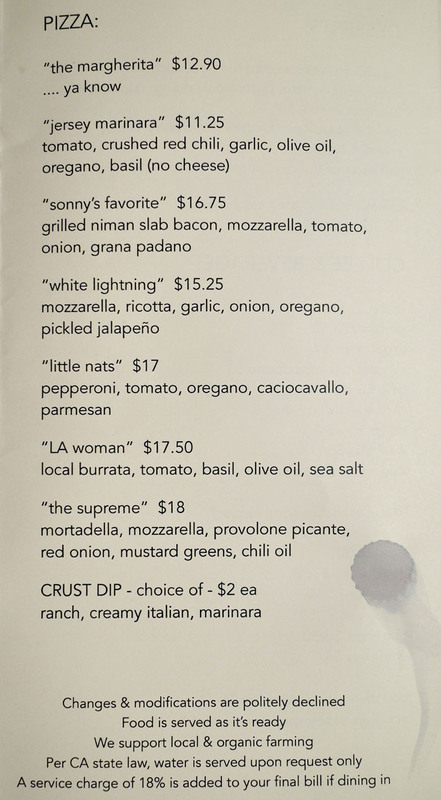 Inside, the 45-seater room is swaddled with white oak, making for a minimalist-ish space that's pretty much the exact opposite of what you'd expect from a quasi-red sauce Italian joint. There's an open kitchen replete with counter seating on one side, and in the back you'll find the cutest wine shop ever, Helen's Wines, helmed by the Chefs' longtime Director of Operations Helen Johannessen. 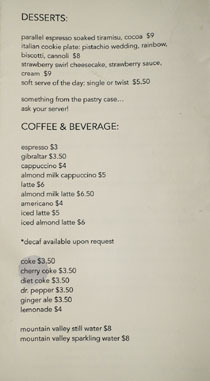 If that wasn't enough, check out Dotolo and Shook's catering operation, which has moved in next door. 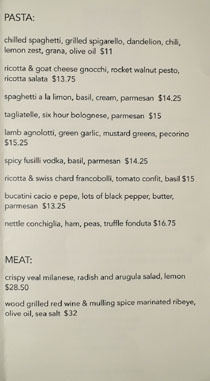 As for Jon & Vinny's menu, it features updated takes on the classics, set in the familiar Italian progression of smaller plates, pizzas, pastas (all made in-house, natch), mains, and desserts. 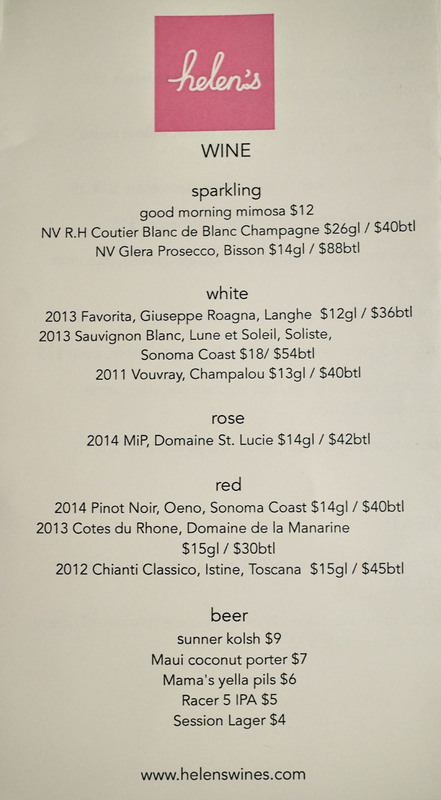 There's a completely different breakfast menu, of course, while to drink, you get to choose from some ho-hum non-alcoholic options, a smattering of beer, as well as Johannessen's selection of vino in the back. Click for larger versions. 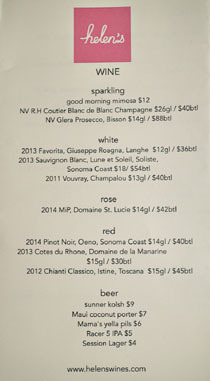 As usual, we commenced with some bubbles, the NV Crémant de Loire Rose, Chateau de Brézé [$45]. It was a nice way to start off, a light, fizzy sparkler that drank dry and crisp, with some red fruit nuances coming in toward the close. 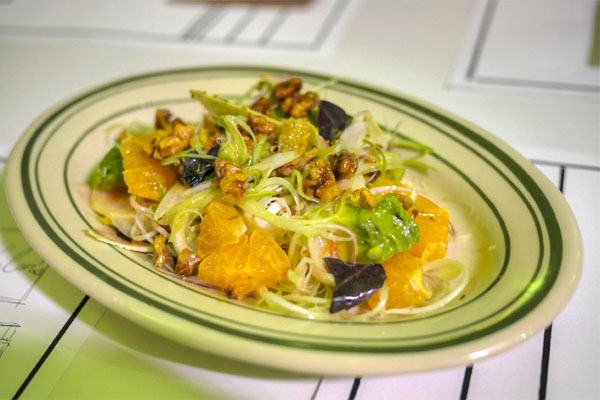 The salad was a pleasant surprise, with some zesty, astringent notes from the onion that paired beautifully with contrasting sweet, creamy elements in the dish. Good crunch from those walnuts, too. We made sure to try a few of the pizzas of course, and began with the O.G. 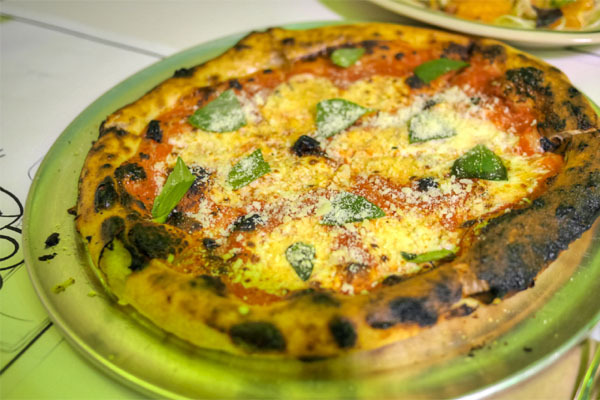 It was classic in essence, with a strong cheesy presence cut by the tanginess of the tomato sauce while the basil contributed some herby aromatics to the mix. Nice crust too, which I found pleasantly bitter and slightly chewy, with the requisite leopard spotting. 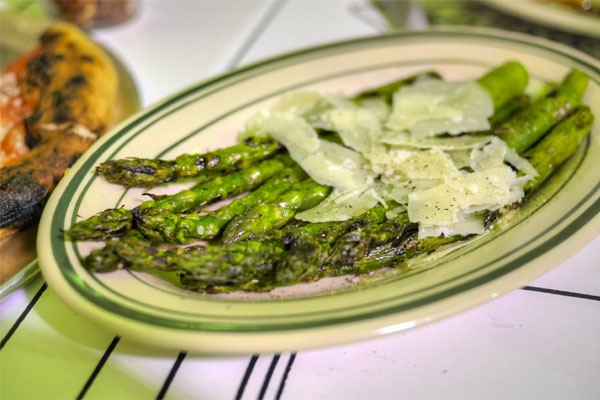 Asparagus arrived delightfully bitter, well-textured and well-charred, the Parm adding further hits of saltiness and heft to the veggie. 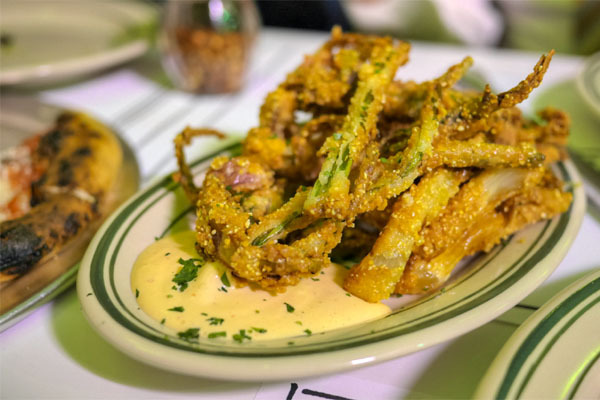 The deep-fried onion ate like a fancified version of an Awesome Blossom (or Bloomin' Onion for those readers Down Under). Satisfying in a somewhat slutty manner, especially when taken with a dab of that tangy aioli. 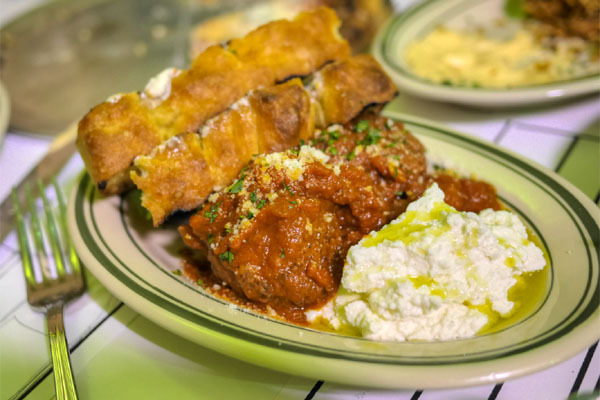 Meatballs were classic and comforting, their savoriness offset by the tartness of the marinara in traditional fashion. 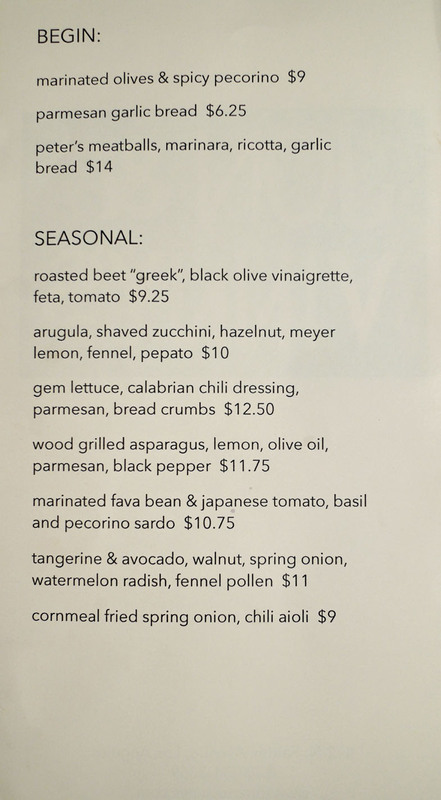 I did appreciate the ricotta here as well, which provided a cool, creamy counterpoint to the meat. 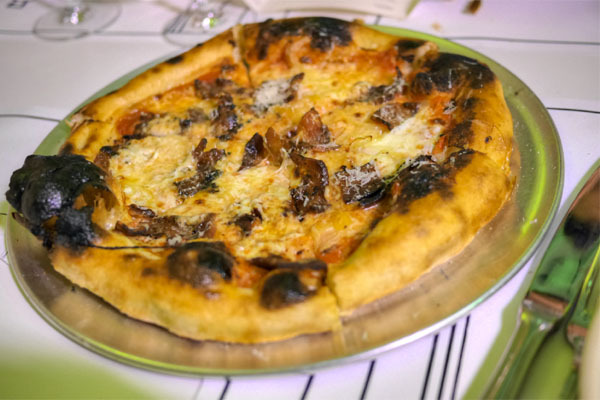 Bacon was clearly the star of this next pizza, giving off boatloads of salt, char, and savor that paired perfectly with the sweet-ish onion. 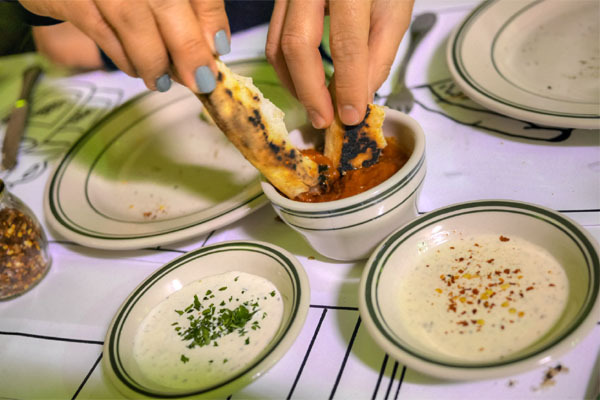 For the crust haters out there, Jon & Vinny's offers a trio of dips: a properly luscious Ranch; a vinegar-y Creamy Italian; and a sweet-tart Marinara. 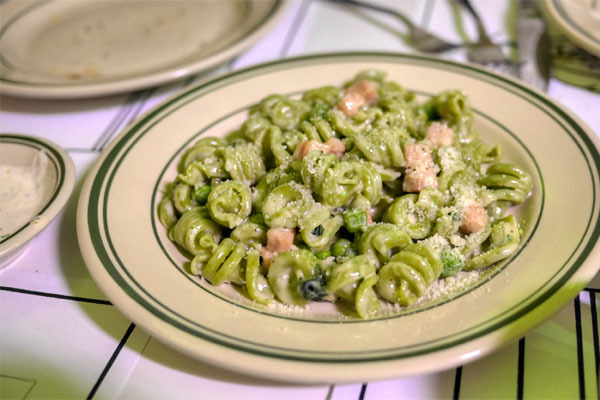 Our first pasta course brought out the conchiglia, a delightfully cheesy preparation that highlighted the classic, always-effective pairing of ham and pea. 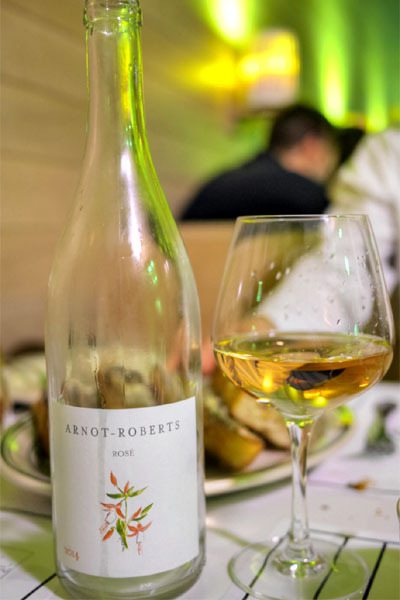 We stuck with rosé for our next wine, the 2014 Arnot-Roberts, Touriga Nacional Rose [$47]. I found this pleasingly floral on the nose, with some juicy stonefruit notes in there to boot. 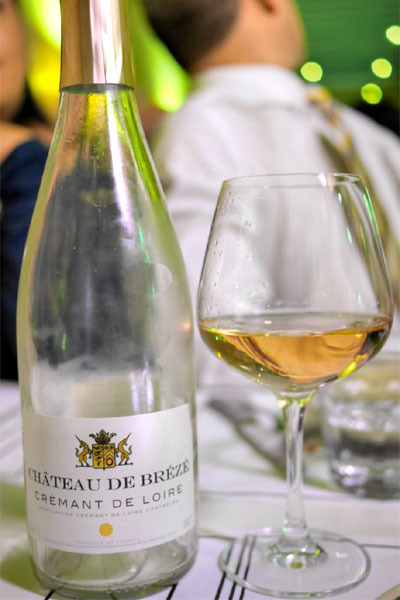 On the plate: much drier, crisp, with some minerality, grassiness, and just a bit more fruit. 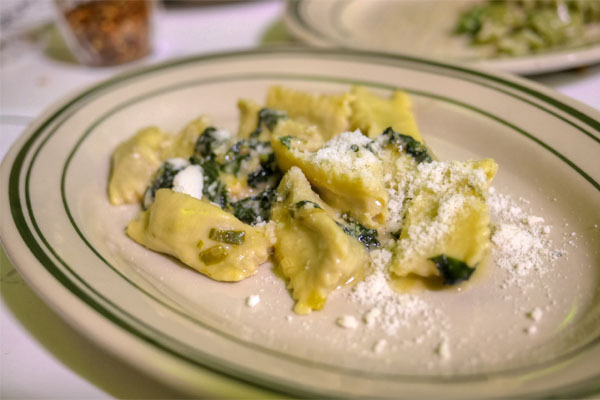 The agnolotti was appropriately lamb-y, with its ovine flavors well-paired with the heft of that Pecorino. Nice offsetting zip from the greens, though I could've used even more. Next, a complementary order of garlic bread courtesy of GM Jessie Kohlberger. 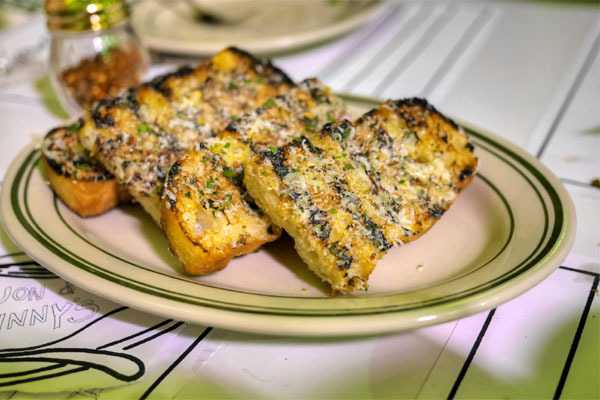 Though it didn't reach the lofty levels of the one I had last time at Trois Mec, it was still a damn tasty example, with plenty of garlicky, herby flavors cut by char and drizzles of olive oil. 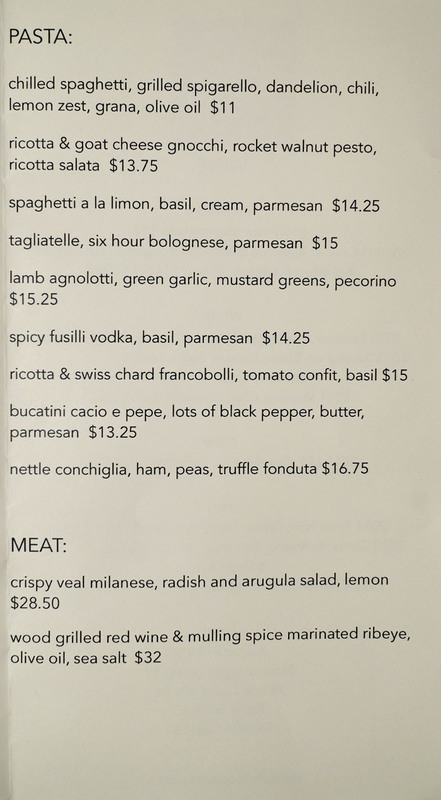 Our final pasta arrived super cheesy, super rich, almost reminding me of an old school Alfredo. Evening things out was indeed lots of black pepper, which imparted a sharp spiciness to the dish that was absolutely crucial. It is interesting to note the texture on the bucatini as well, which was cooked past al dente to a soft, though not unpleasant consistency. It's like the sort of pasta my parents would actually eat. Finishing out our savories was the appropriately-titled supreme. I got a very gratifying meatiness from the mortadella here, which went swimmingly alongside the zippiness of the red onion. Nice touch of heat underscoring everything, too. Getting into dessert now, the cheesecake was wondrously jammy, with the sweet fruit pairing well with the lactic notes present. Lovely savoriness on the crust to round things out. 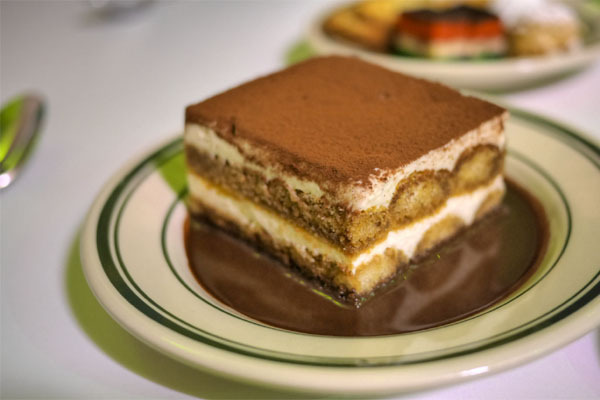 The tiramisu was a fairly archetypal presentation. Lots of cocoa here, though the cake was still light and airy, with the coffee coming in more toward the finish. 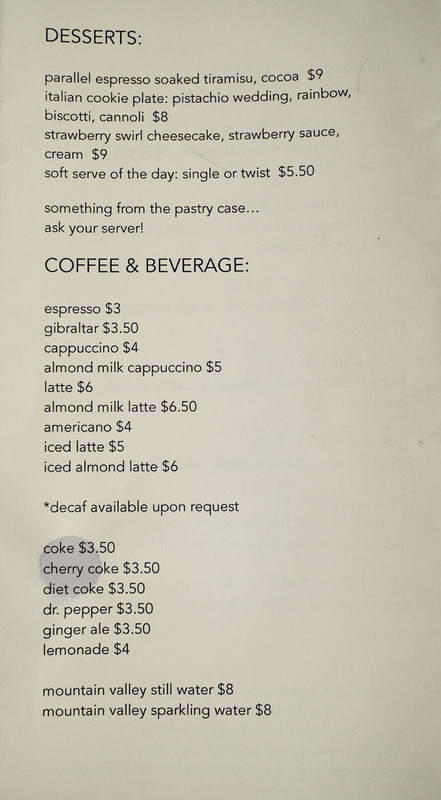 Next was an item from the pastry case. 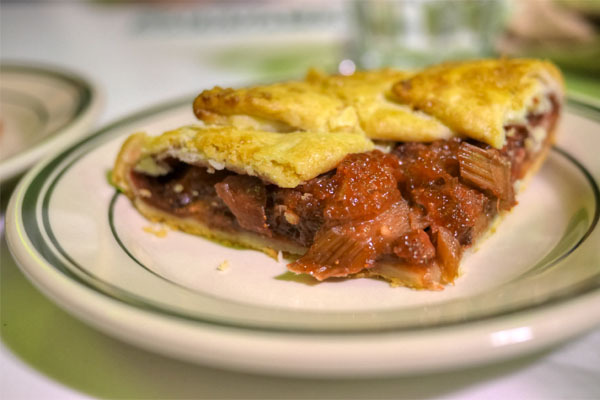 The crostata ate ultra jammy, sugary, fruity, though it was never cloying thanks to the contrast provided by the crumbly crust. 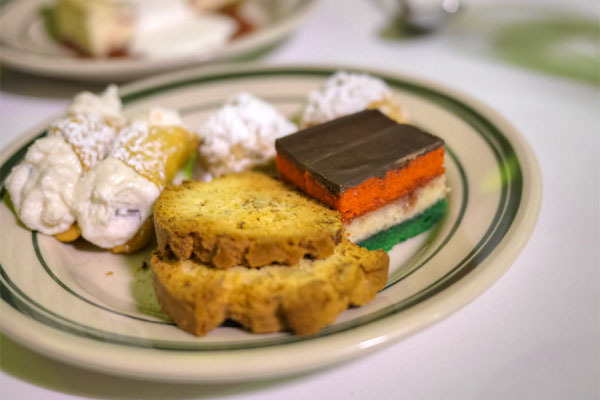 Finally, some treats to close out the evening: colorful Rainbow cookies, minty and sweet; nutty, dry Pistachio Wedding cookies; Cannoli with a particularly floral filling; and a couple pieces of nutty, herby Biscotti. Not surprisingly, Ludo and Krissy stopped in for a bite. Also spied this evening were Chef Tim Love and Jimmy Kimmel (who was also present at Trois Mec's debut). 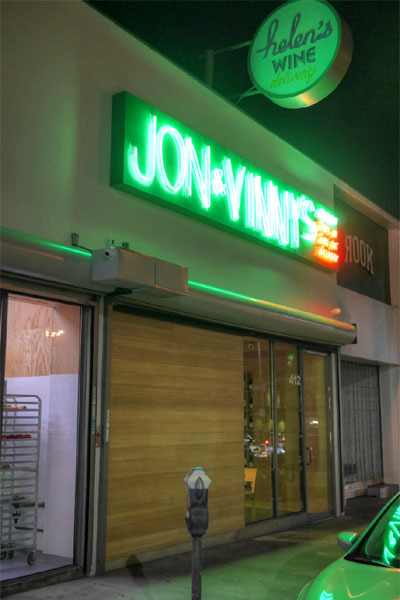 Jon & Vinny's seems like a neat, neighborhood-y little spot, sort of a refreshing departure from the duo's previous projects. 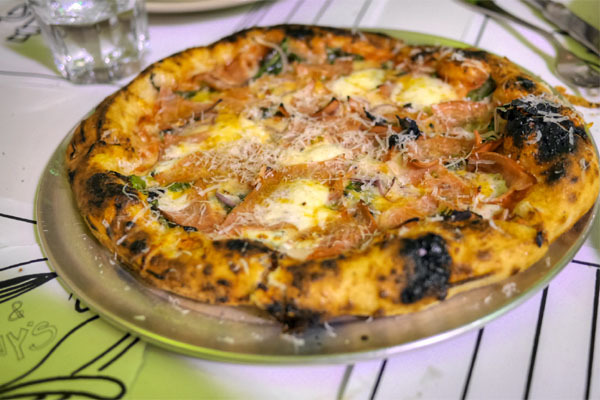 You're not going to find the modernistic culinary stylings that you might get across the street, let alone at Trois Mec. 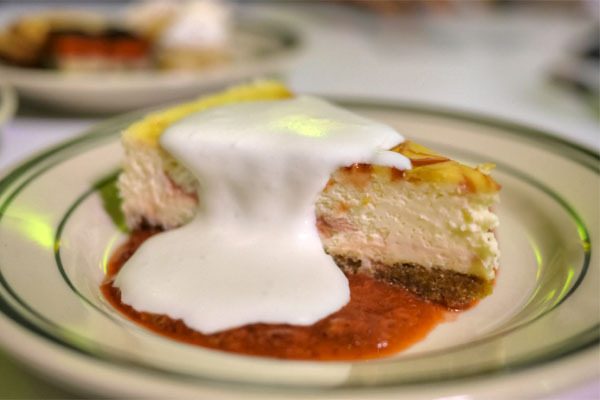 Rather, you get cozy, comforting classics, but executed in a manner that you'd expect from the Chefs. 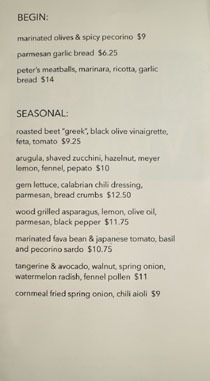 The restaurant delivered pretty much exactly what it advertised, and looks to be a worthy addition to their portfolio. Please stop with the "slutty."